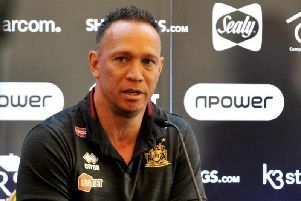 Shaun Wane is hoping Saturday’s opponents Catalans are distracted by their appearance in the following week’s Challenge Cup Final. The Warriors head to the south of France later this week aiming to tighten their grip on second spot in the ladder – a position rewarded with a home semi-final. Steve McNamara’s Dragons face Warrington at Wembley the following week and Wane – twice a Challenge Cup finalist as a coach – knows it may be difficult to keep their focus on the here and now. “It’s tough, without a shadow of a doubt,” said Wane. “However you dress it up, it’s hard because you’ve got that in the back of your mind. “But what they have are a lot of experienced players like Micky McIlorum and Louis Anderson who have been in positions like that and know what it’s about, and we’ll be preparing for that. Wane has favoured day-raids to Catalans but after their most recent trip was hampered by delays at both ends, Wigan will this time head over for a long weekend. “This time we’re going over the day before and coming home on the Monday,” he said.